(Newser) – In all the time humans have been exploring the ocean, there have until now been just nine recorded sightings of conjoined aquatic mammals. That's only partly why the Washington Post calls a recent catch in the North Sea "a one-in-a-billion discovery." 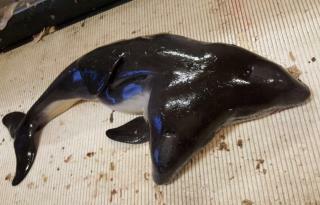 Dutch trawlers on May 30 discovered a two-headed harbor porpoise among their catch. Believing it would be illegal to keep the deceased specimen, they returned it to the water after first snapping four photos, per National Geographic. When Dutch researchers got hold of the images, they were amazed to see the first known conjoined twin harbor porpoises, with two fully-formed heads and a single well-developed body, estimated to be about 27.5 inches long and weighing at least 13 pounds, according to a Deinsea study that notes five of the nine previous cases (this makes 10) involved fetuses.